I highly recommend enjoying this meal with a glass of Crémant du Jura sparkling wine and making some paleo, gluten free and vegan chocolate chip cookies like Cappello's cookies! Preheat oven to 400 degrees F. Place a wire rack on a rimmed baking sheet, spray with coconut oil spray, and place 4 pieces of bacon on the wire rack. Place in oven to bake for 13-15 minutes, until slightly crispy. While bacon cooks, cut each potato lengthwise in to 1⁄2 inch pieces. Then use a small heart shaped cookie cutter to cut out heart shapes of each potato slice. Repeat with all potatoes then place in a large bowl, add the ghee and salt, then toss to combine. Place in air fryer, turn temperature up to 400 degrees F and cook up to 20 minutes, depending on size and thickness of the potatoes. At every 5 minutes of the 20 minutes, pause the air fryer and toss the potatoes. This will help them evenly cook throughout. Leave in the air fryer to keep warm. While the potatoes cook, use a meat tenderizer to pound the chicken thighs to about a 1⁄4 inch thickness. In a bowl, mix together the garlic, cheese, parsley, and rosemary until combined. Place 1-2 tablespoons of the mixture on to each chicken thigh, spreading throughout the entire piece of chicken. Then roll each piece of chicken. Sprinkle with salt and pepper, then carefully wrap each piece of rolled chicken in one piece of prosciutto. Heat a medium cast iron skillet over medium-high heat and sear each prosciutto wrapped chicken, about 3 minutes per side. Once the bacon is done cooking, set aside and turn temperature down to 350 degrees F. Place the cast iron skillet with the chicken in the oven and bake for 20 minutes. Add the arugula and spinach to a large bowl with the bacon, radishes, tomatoes, and Caesar dressing, then toss to combined. Sprinkle salt and pepper on top before serving. 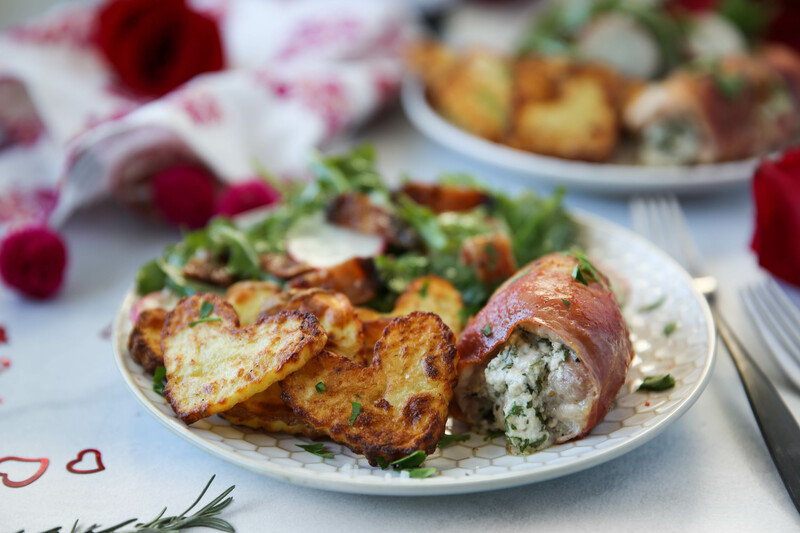 Serve the salad with 1-2 pieces of the prosciutto chicken and the heart shaped potatoes. And don’t forget to pour yourself and your loved one a glass of Crémant du Jura sparkling wine and/or make some gluten free cookies to enjoy after dinner!